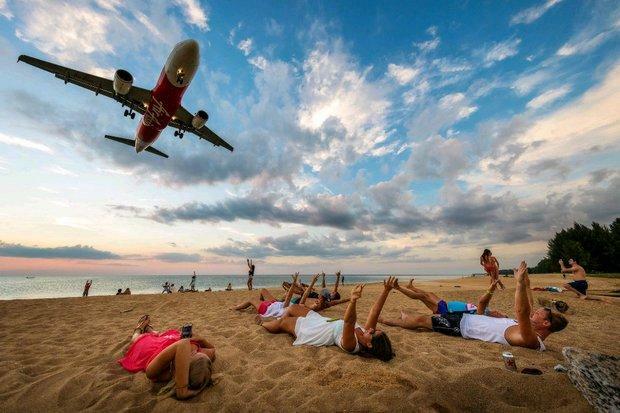 PHUKET: Authorities are finding ways to keep tourists at Mai Khao beach off the adjacent Phuket airport's runway after the area became known as the "unseen Phuket", where beachgoers take selfies with landing planes but create safety concerns over their close-up shooting. A new safety zone near the runway is being developed and will soon take effect, deputy Phuket airport chief Wichit Kaeothaithiam said Thursday after meeting provincial officials. At present, planes flying across the sea to the resort island generally land on runway 09, approaching directly over Mai Khao beach. The sight of aircraft flying over the beach as they land has become a must-see for many tourists. However, officials believe taking photos with the planes is dangerous. Mr Wichit insisted authorities must apply strict safety rules as required by the International Civil Aviation Organisation. The airport wants to boost tourism revenues, but at the same time, it must make sure there will not be any problem with aviation regulations. Tourism and safety must co-exist, Mr Wichit said. He also warned people, businesspeople and tourists living within a nine-kilometre radius of the airport against flying drones and shining flashlights at planes. His warning followed a report that the acts have caused disturbances to pilots. Violators are subject to punishments under the Air Navigation Act. "The maximum penalty is the death sentence," Mr Wichit said.